After arriving in the Andes with no expectations and no Spanish language skills, Gretchen Finn found adventure, gorgeous views, and a feeling of being home away from home. A reader story. ANDES MOUNTAINS, Argentina – I came south with no expectations and only enough Spanish to order wine. Driving up the Andes Mountains, nerves and excitement dance in the pit of my stomach. I keep my eyes fixated on misty mountain tops, children running dressed in alpaca sweaters, and the occasional cow challenging us for space on the road. The view en route to Quebrada del Condor. After an hour and a half in the car with Rolo, the quiet and rugged mountain man who is to be my guide, I arrive at , a family-owned ranch in the mountains of Argentina. We're greeted by Eduardo, the gaucho who will take me high into the Andes on horseback. Eduardo is interesting — rugged and jolly, with eyes that glisten with many past memories. His smile is bright against his weathered pink cheeks and his greeting feels familiar, as if I'm part of the family. After handing me the coat off his back for the ride, Eduardo, Rolo, and I head down to the barn where my horse, Mandingo, awaits my arrival. I'm told to saddle up, which I attempt with as much grace as I can muster, hoping to hide the fact that I haven't ridden in a few years. I must have fooled them because they give me a quick breath of Spanish directions and before I know it we're off, the dust of the Andes Mountains creating clouds beneath Mandingo's hooves. The gaucho Eduardo working on the ranch. The sky is a haunting blue with reflections of green from the terrain; the air is cool and moist. There is nothing around us except the vast mountains and skies and the smell of lemon thyme growing in the fields. Eduardo shares stories of the land and the family, and I quickly realize how connected the two are to the family's happiness and future. I don't know if it's my lack of Spanish that keeps me from speaking or the fact that I'm completely intoxicated by every story, every view, and every rock Mandingo trips over. I learn that it's far more valuable to listen and hang on tight than to try to talk. We stop to rest the horses and I follow Rolo and Eduardo to a crystal clear stream. Out of the corner of my eye I notice Rolo fill his palms with water and drink it. I follow suit in hopes of earning my place among their ranks. It isn't until I pass a cow carcass that I reconsider drinking from the stream. Eduardo must see the uneasy look in my eyes because he assures me the puma that killed the cow is probably gone by now. Now that I know I'm in puma territory, a stream water cocktail becomes much less daunting. I canter alongside my gaucho and can't shake the beauty of this place. We turn the corner and Mandingo takes me to a cliff. We freeze at the edge as Eduardo raises his worn hands to his mouth and bellows something in Spanish. 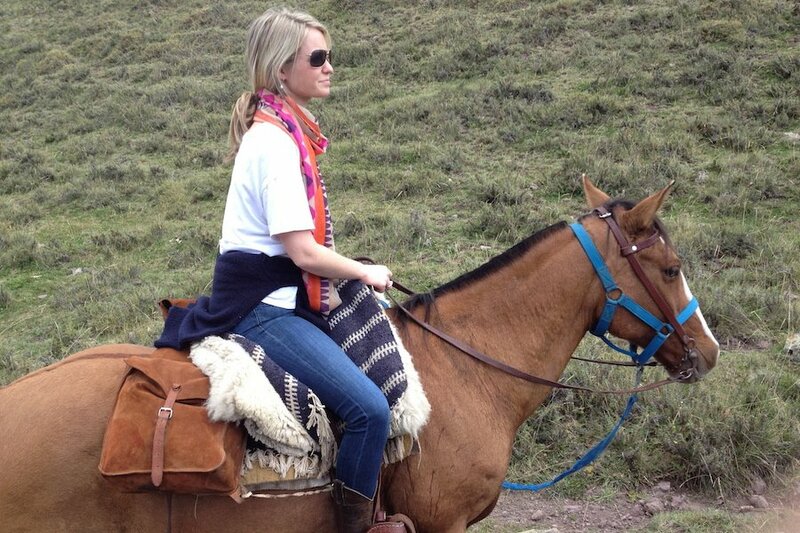 We ride down the steep trails, and I give my trust to my gaucho and my horse. Smoke from the distance signals that the asado back at the ranch is underway, waiting to welcome us home. My legs are stiff and my heart is heavy as I dismount — I don't want those views to vanish. The author feeling at home at La Quebrada Del Condor. The ranch is busy. Extended family arrive for an Argentinian barbeque. They give greetings and kisses and pour glasses of malbec. Two flat-top grills are covered with carne, sausages, empanadas, and cheeses. The barn cat chases my boots as I set the table. I'm humbled by the unpretentiousness of the affair. After multiple ¡saluds!, the family passes around plates of delicious food and passionately tells stories. I scrape my plate clean of malbec-poached pears and crème made by Eduardo. After espressos, Eduardo gives us an impromptu lasso lesson (and gives me false hope that maybe I can return to live amongst the gauchos and pumas). I am grateful. The owner senses my unspoken joy, hands me a horseshoe from the ring and smiles: Buena suerte. I never want to leave this place. Rolo and I hug the family goodbye and crawl into his car to head back down the mountains. I'm so full and so heartbroken at the same time that tears flood my eyes. I hold the horseshoe and a handful of lemon thyme from the fields and gaze out the window as the Andes become more distant by the minute. I feel as if I've been given the gift of unexpected inspiration and peace with a healthy dose of adventure and family. My day at La Quebrada del Condor will forever be one of the most incredible experiences of my life. Do you have a travel story to share? Popupla wants to hear it.